Irving, who scored 10 of his season-high points in the overtime period, became the first Celtics player since Larry Bird to score at least 45 points on 70 percent shooting, according to ESPN’s Stats and Info. The point guard, who scored 25 of his points in the first half, shot 16 of 22 from the field overall and made five 3-pointers in the win. He also converted 10 of 11 free throws and dished out six assists for the Celtics (16-2). Boston trailed Dallas 87-74 when Dwight Powell made a layup with 7:47 remaining, but Irving and Co. rallied to send the game into overtime at 96-96 before stealing it in the extra period. Jaylen Brown, who gave the Celtics a 104-102 lead with a jumper with 1:39 to play in overtime, finished with 22 points on 8 of 13 shooting with nine rebounds. Jayson Tatum, whose alley-oop lay-up rimmed in to send the contest into overtime, added 15 points and nine rebounds, while Marcus Smart ended with 12 points and eight assists off the bench for Boston, which was coming back from its third successive double-digit deficit. 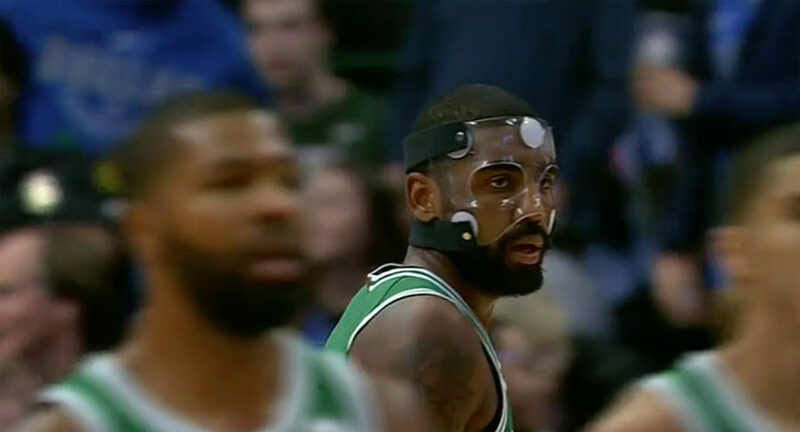 “For us, it’s just about battling back when teams get a comfortable rhythm, whether it’d be in the first half or the second half,” Irving, who was 9 of 9 from the field at one point in the first half, said. Harrison Barnes had 31 points and six rebounds for Dallas (3-15), but missed a jumper with less than a second to go in regulation that could have won it for the Mavericks. “At the end of the day, it’s got to show up in wins and losses,” Barnes said. “There are no moral victories around here. Wesley Matthews ended with 18 points, six rebounds, four steals and three assists in the defeat. J.J. Barea scored 16 points off the bench for Dallas and Dirk Nowitzki added 14 points and 12 rebounds, but his lone turn over was a costly one, as Boston scored off it to send the game into overtime. The Mavericks, who came back from an early double-digit deficit, were losing for the fifth time in six games. “We just needed to make a couple more plays at key times,” Mavericks coach Rick Carlisle said.